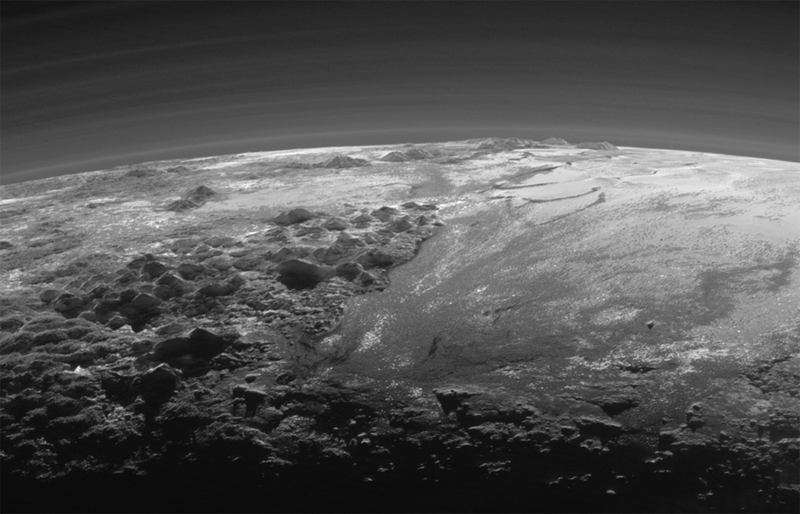 A backlit, haze-covered Pluto imaged by New Horizons on July 14, 2015, from a distance of 11,000 miles (18,000 km). CLICK FOR FULL SIZE. Credit: NASA/JHUAPL/SwRI. Hold on to your seats, hats, socks, etc… these newly-received and -released images of Pluto from the New Horizons spacecraft are, in a word, icantbelievewhatimseeingisreal! But they are real, and that’s what’s so great! Obviously you’re already looking at one of them above: it’s a view of Pluto captured after New Horizons had already made its closest pass over Pluto on July 14 and was moving into its night side, giving a literally unprecedented perspective of the planet in backlit detail. With this low-angle lighting Pluto’s surface features are emphasized and its multi-layered atmospheric haze is highlighted in amazing detail. 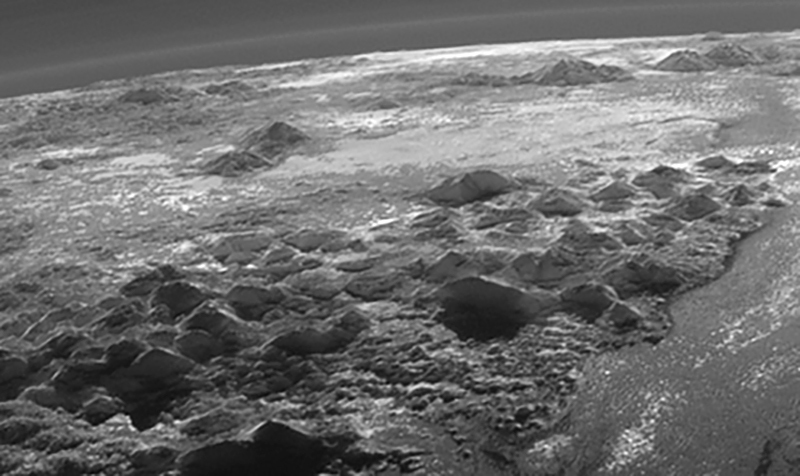 Let me sum up what we’re looking at here: this is sunset in the mountains of PLUTO! 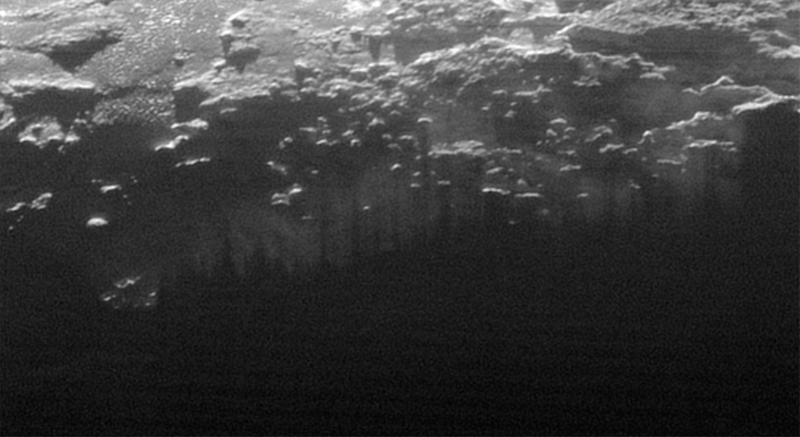 In another image shadows cast by Pluto’s mountains extend through a foggy atmosphere. There’s a lot going on both on Pluto’s surface as well as above it! The images were acquired with New Horizons’ wide-angle Ralph/Multispectral Visual Imaging Camera (MVIC) and were received on Earth on Sept. 13. With the relatively slow bandwidth speed of the spacecraft’s transmitter and the enormous distance between it and Earth (33 times farther away from the Sun and increasing daily) it will take over a year to downlink all of New Horizons’ data from its flyby. But, as these pics show, it’ll be worth the wait! In addition to the stunning views above a new high-resolution image has also arrived of Pluto’s 750-mile-wide moon Charon, captured by New Horizons about 10 hours before its close pass by Pluto. In this new version, details on Charon’s surface are resolved down to 2.9 miles (4.6 km). 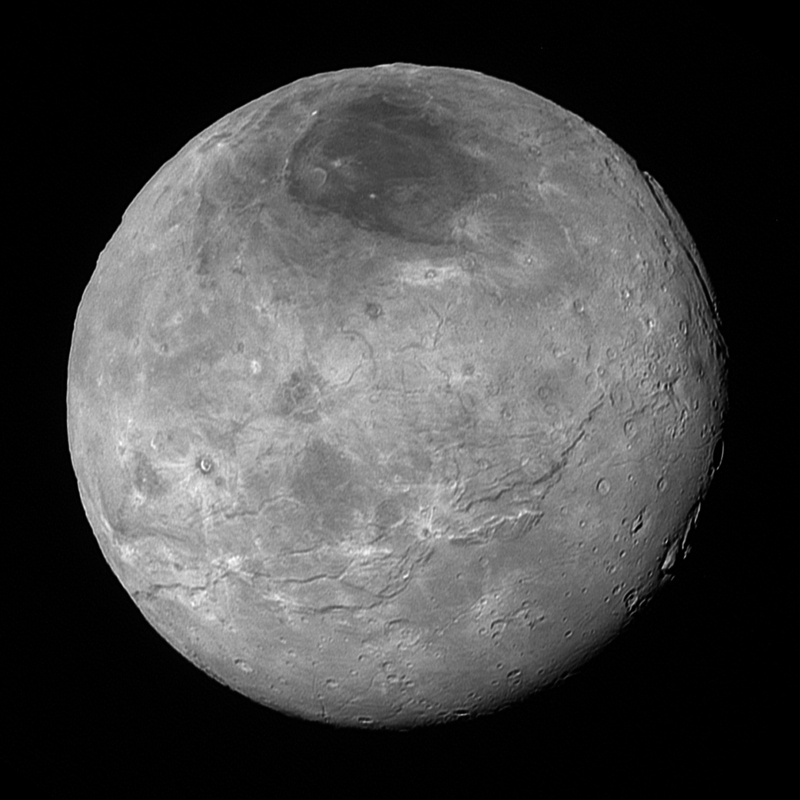 Pluto’s largest moon Charon imaged on July 14, 2015 from about 290,000 miles (470,000 km). NASA/JHUAPL/SwRI. See more images from the New Horizons mission to Pluto and into the Kuiper Belt here. Source: New Horizons/SwRI/NASA HT to Alex Parker for the hi-res. *Update: here’s an even closer look, made by cropping and enlarging the MVIC image above. Enhance!!! Thanks — I do that a lot. To explore strange new worlds – thanks ! Pluto certainly has a lot more `personality` than anyone ever expected. Just imagine the photos you could get if we could put a probe on the surface. Thanks for relaying these, pictures are an awesome achievement. Perhaps this is a worthy “planet” after all. Yey Pluto! Wow !! Awesome images ! !